Three principal species go by the name ephedra, also known as a Chinese botanical, ma huang. 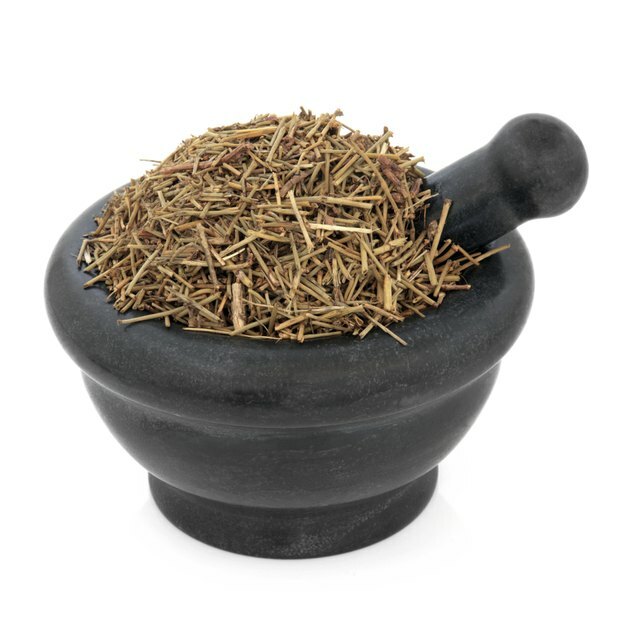 Ephedra, a shrub-like evergreen plant, contains several active alkaloid compounds, including ephedrine, pseudoephedrine and phenylpropanolamine, also known as norephedrine. Since 2004, ephedra and ephedrine alkaloids, which are central nervous system stimulants, have been banned as a dietary supplement by the U.S. Food and Drug Administration. Take medications containing any form of ephedra only under the supervision of a physician. Ephedra and its plants compounds were banned from sales as a dietary supplement due to several deaths and other serious side effects and because of the potential for abuse. Unlike ephedra and its alkaloid compounds, ephedrine is still available in pharmacies. But the ephedrine available is synthetic, manufactured in the laboratory and sold and regulated as a drug, not as a dietary supplement. Before 2004, ephedra was sold as part of a number of weight-loss and energy supplements used to enhance athletic performance. Ephedrine is currently sold primarily as a bronchodilator for use in asthma and other disorders that cause tightening and spasms of the bronchial tubes, which make breathing difficult. Both ephedra and epinephrine have similar effects. As central nervous system stimulants, they stimulate cardiac muscle, which increases heart rate and raises blood pressure. They relax smooth muscle, which opens bronchial tubes. These drugs can also cause nausea, appetite loss, anxiety, dizziness, muscle aches, nervousness, tremor, elevated pressure within the eye and insomnia. More serious side effects include addiction, mania, depression, seizures, stroke or suicidal ideas. Supplements that contain either ephedra or ephedrine along with caffeine have potentiated effects and increased potential for severe side effects. At least 100 deaths were attributed to ephedra before it was banned, according to the text "ACSM's Primary Care Sports Medicine." Both ephedra and ephedrine have potentially life-threatening side effects. While ephedrine also has legitimate health uses, its potential for abuse as well as its use in the manufacture of amphetamines has limited its sales in the United States. In some states, the drug is sold by prescription only, while in others, the amount of the drug that can be purchased is tightly regulated, with no more 3.6 g per day or 9 g per month allowed to be sold. Ephedrine is kept in a locked cabinet or behind the counter, and purchasers must show identification and logbooks of purchases must be kept for at least two years, according to Drugs.com.